We’re happy to announce the following speakers for the 2017 CIMSEC Forum for Authors and Readers (CFAR) on May 1st, top vote-getters in their respective categories. Congratulations to the authors, presenters, and all the nominees! —-CIMSEC Category—- Is Sea Shepherd a Navy? 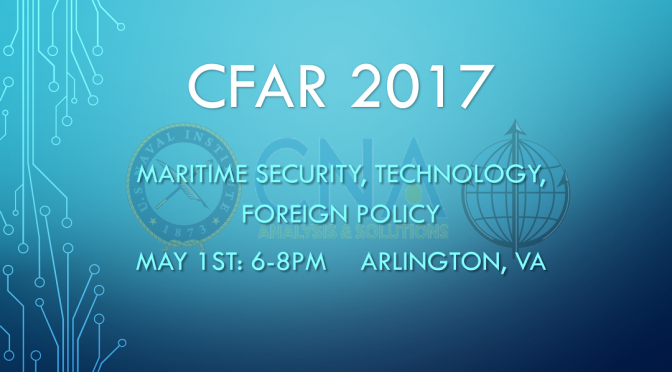 A CIMSEC Debate Chris Rawley, Claude Berube, and Ryan Mewett Terrorists on the Ocean: Sea … Continue reading CFAR 2017: And the Speakers Are….